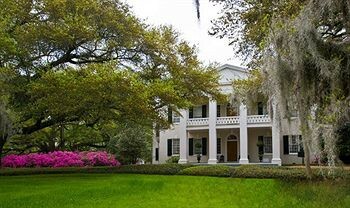 Property Location When you stay at Monmouth Historic Inn in Natchez, you&apos;ll be in the historical district and convenient to Old South Winery and Natchez National Historical Park. This 4-star inn is within close proximity of Stanton Hall and Rosalie Mansion.Rooms Make yourself at home in one of the 30 air-conditioned guestrooms. Complimentary wireless Internet access keeps you connected, and cable programming is available for your entertainment. Bathrooms feature bathtubs or showers, designer toiletries, and hair dryers. Conveniences include phones, as well as complimentary bottled water and a turndown service.Rec, Spa, Premium Amenities Take in the views from a garden and make use of amenities such as complimentary wireless Internet access and concierge services. Additional amenities include gift shops/newsstands, wedding services, and tour/ticket assistance.Dining Satisfy your appetite at one of the inn&apos;s 2 restaurants. Quench your thirst with your favorite drink at a bar/lounge.Business, Other Amenities Featured amenities include complimentary high-speed (wired) Internet access, a business center, and a computer station. Event facilities at this inn consist of a conference center and a meeting room.